5.5 HP HONDA ENGINE 19" wide x 3" max depth. Weight 242lbs dry plus 50lbs with water tank filled. Lenght 57" width 29" Height 52.5" Handle folds for transport. 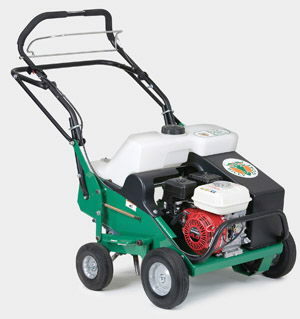 * Please call us for any questions on our aerator 19 inch billy goat rentals in Portland OR, Gresham OR, Milwaukee OR, and surrounding metro area.